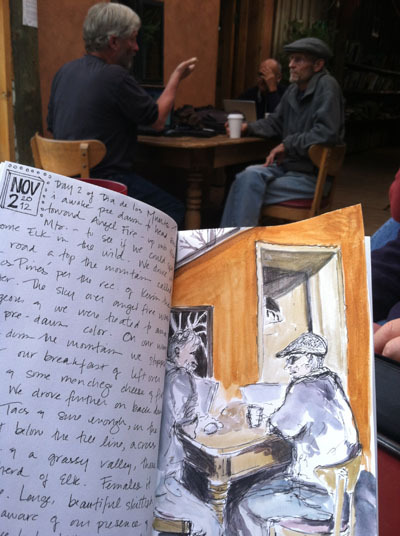 Any of you lovely readers who follow this lowly little blog know that one of the highlights of my working year is a now annual Travel Sketch Journal Trip to Taos, New Mexico. Over the past few years I have partnered with the Art Academy of Cincinnati to create a unique, outside-of-classroom art experience for creative adults looking to hone their observation and basic drawing (and beyond!) skills thru the vessel of a simple blank book. Plans are already in full swing for 2013. If you are local to Cincinnati, there is an information night next Wednesday, Nov. 14, at the Art Academy where folks will have a chance to meet me, ask questions and see a few slides of what a week in Taos looks like and some of the work we have done in years past. I hope you will join us. That said, one huge goal of mine this year is to include participants in the class who are not from the local Cincinnati area. We already have someone from San Diego, a potential from Austin, TX…. If you have been eyeing this class from afar, this is your year to join us! And please bring a friend! Email me directly if you need more information. A really cool thing about going back each year to a sweet place like Taos is that I get to discover new things about it each year. 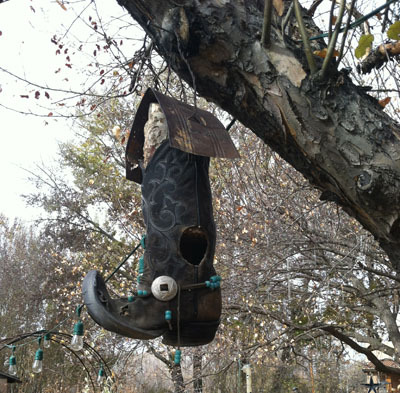 I have made friends in Taos whom I visit upon arrival each year. And this year things got even richer. I was approached last winter by film maker Jody McNicholas about being part of a DVD project that would provide a retreat experience for people who might not necessarily be able to/ desire to travel to a far flung place but wanted to try some of what happens at a retreat. I officially became a part of the Eco Chic Retreat last summer, filming a short segment introducing the idea of keeping an illuminated journal. 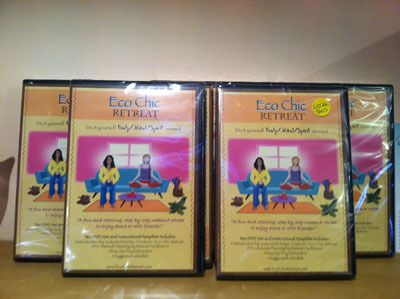 The DVD is now finished and the Eco Chic team is diligently working to get the word out about this amazing project. For just $50 you can give yourself or a loved one the gift of self care in this 3 day retreat experience. There’s cooking, art, meditation, yoga and more!! It’s a beautiful film and I am so proud to be a part of another something that helps people feel creative and well. 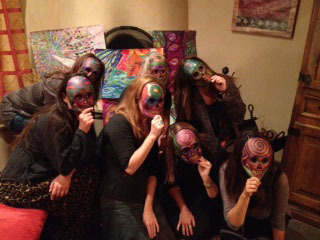 Most of the Eco Chic team is fairly far flung in the world and we filmed our segments separately with Jody at the helm. Over time, we have all gotten to know one another virtually by connecting via email and facebook and such. But we all desired to meet personally, as we agreed this project has taken on a life of it’s own. 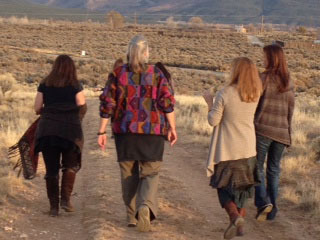 So last week, my hub Tony and I cashed in some hotel points, and airline miles and headed to Taos to meet as many of my fellow Eco Chic facilitators as could make the trip. 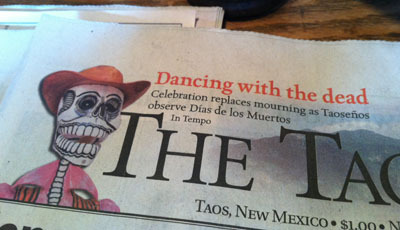 This trip happened to fall over the Spanish holiday tradition of el Dia de los Muertes, the Day of the Dead which is an exciting time to be in New Mexico. Below are a few pics of our time out there and some sketches we made along the way. 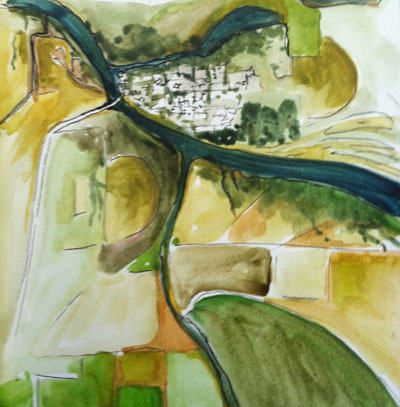 I’m hoping it will whet your whistle to come along next summer when we go for the sketch trip…. 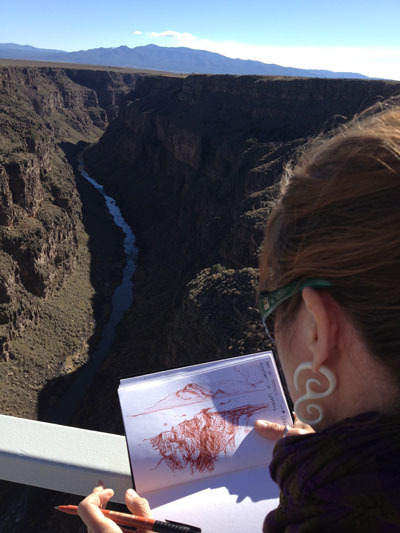 One of my favorite things about getting into Taos is having to cross over (or drive down into) the Rio Grande Gorge. It’s an amazing place. Deep and full of mystery and shadow and the sweet green river running quietly down below. 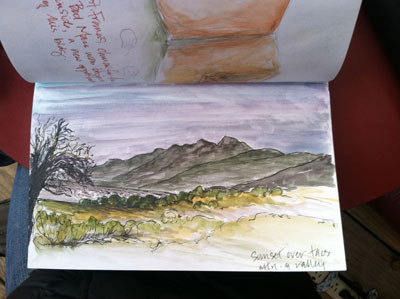 It’s a great place to draw and get a sense of how to use light to create space in a drawing. 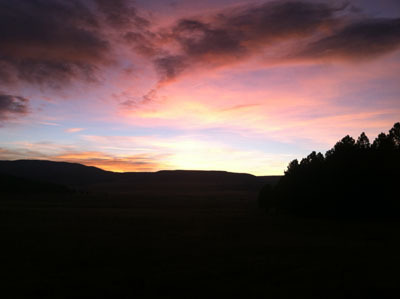 Often when I am teaching in Taos, I don’t get out into the countryside enough, so on this trip that was a priority. We were up before dawn a couple of different days to experience all the mountains had to offer. 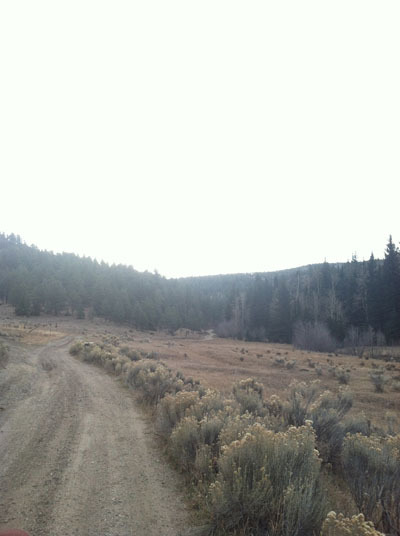 One morning we were treated to the sight of a herd of female elk. I spotted them across a wide valley and just at the bottom of the tree line. They blended so beautifully that only their slight movement gave them away. The camera could not capture them. 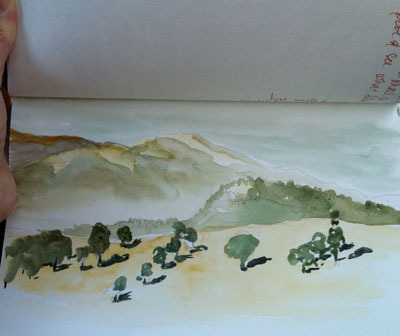 Only fields and mountains stayed still enough to make drawings…. I love windy roads/ drives which head into the hills. I have often thought it would be lovely to have access to a little place just around the bend down one of these remote driveways where I can escape and find quiet when needed. 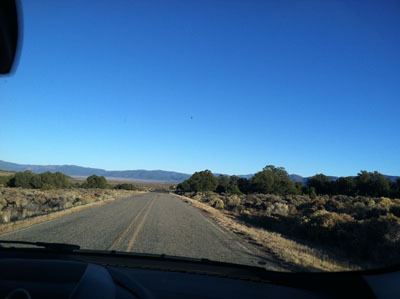 Funny thing is, this was not that far from Taos town. It gets remote out there fairly quickly. 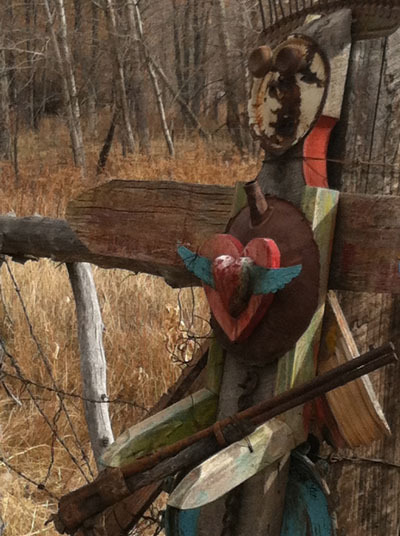 As I wrote earlier, each trip to Taos seems to result in a new friend or two. This trip was no exception. 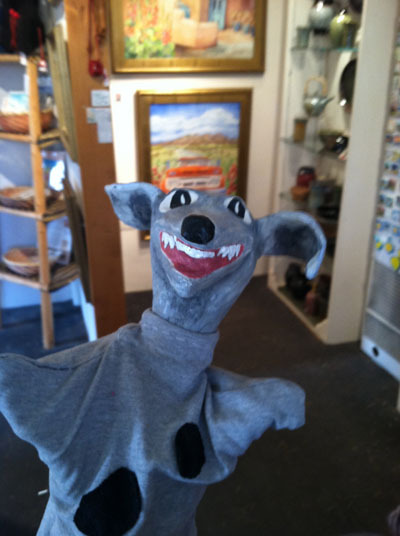 I met Leslie, a puppeteer/puppet maker living in Taos and she introduced me to some of her lovely hand-made hand puppets. 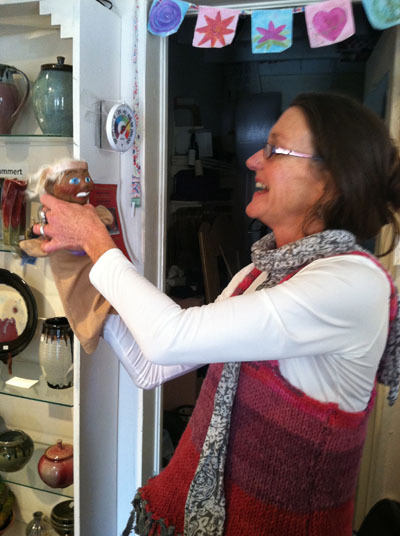 I couldn’t make it to her show as we had an Eco Chic dinner scheduled, but I thoroughly enjoyed meeting her and her puppets. I have a feeling we will meet again! 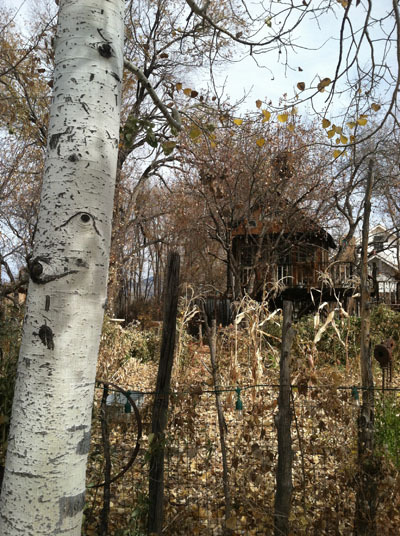 We joined my friend Kate for tea one afternoon at a delightful little ‘Apothecary’ tucked back away off the main road near some gallery spaces in the bosom of Taos Mountain. April, the proprietess at this lovely shop, created amazing warm drinks for us from magical combinations I have never tried before. They were delicious and good for the body as well as the soul. 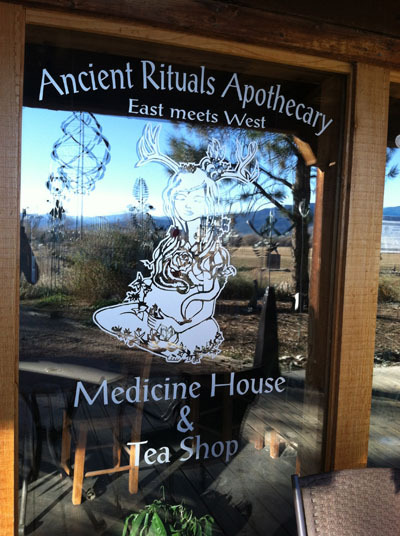 Taos being the small town that it is, it turns out that April has created a special tea blend just for Eco Chic Retreat!!! Of course, meeting my fellow Eco Chic facilitators was the purpose and highlight of this trip. 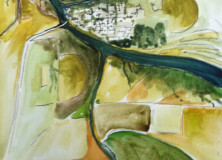 One afternoon we gathered to take a painting class led by Jan Haller at Magic Brush Studios. We painted in response to the colors with no plan or attachment to outcome. It was very freeing and fun!!!! On another day we visited with Louise Lowry, chef in the ECR at her rented house just outside of town. This is a magical place with charm and eccentricity around every corner!! 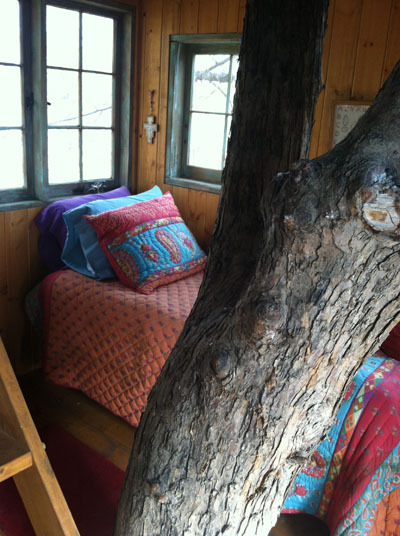 There was a tree house. And guest rooms in the former chicken coop. And quirk around every corner. Of course I felt right at home. 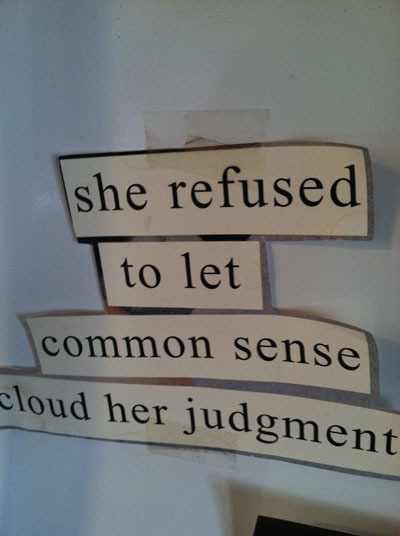 And we had some tea and cookies. We left Lou to do her shopping for that night’s dinner party and went to see some art in the afternoon at the famed Harwood Museum. There was much to see both new and old. 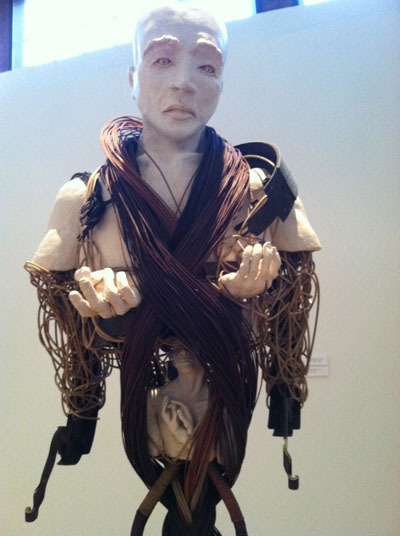 What stuck with me was the work of Maye Torres who lives outside of Taos and makes amazing mixed media sculptures and paintings. Her work is haunting. 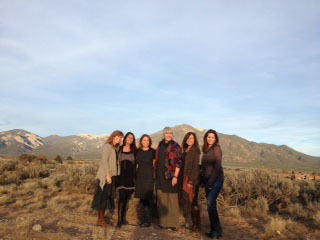 Our final evening in Taos was spent convening with the Eco Chic team. It’s simply amazing to meet a group of people with whom you feel immediately connected. Strangely, we all felt as if we had known each other for years. Conversation was easy and comfortable. The food, thanks in large part to Louise (and Jan’s desserts!!) was out of this world. We had a fabulous time. 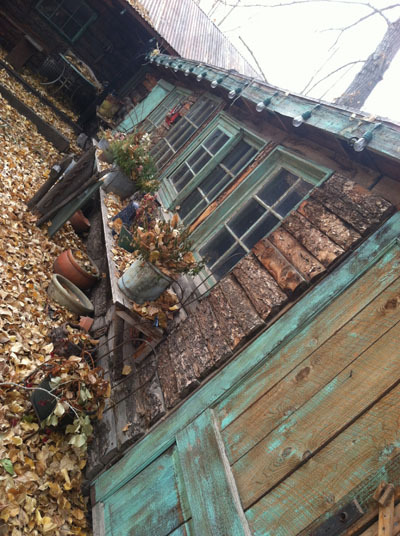 It is with an ever heavier heart that I leave Taos each time I travel there. This time it was so wonderful to take Tony and give him a taste of what a trip it is to get to this amazing place. Aside from Eco Chic work, I was free to be more of a tourist, which will make me an even better prepared instructor for next summer’s Sketch Journal trip. 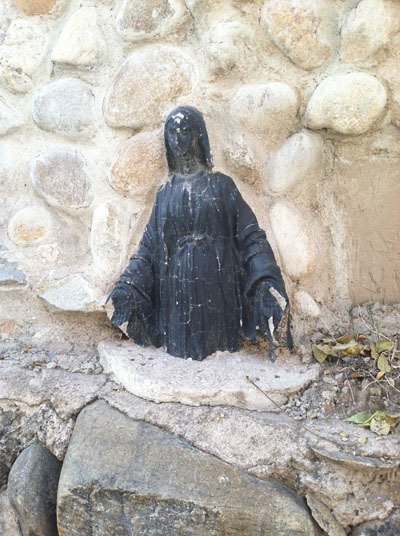 We rounded out the trip with a stop in Chimayo to see some sweet old adobe church structures. 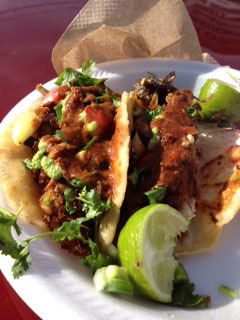 We also had some tacos at the BEST taco truck EVER (in Santa Fe, kitty corner across from Trader Joe’s on the main drag to Taos). 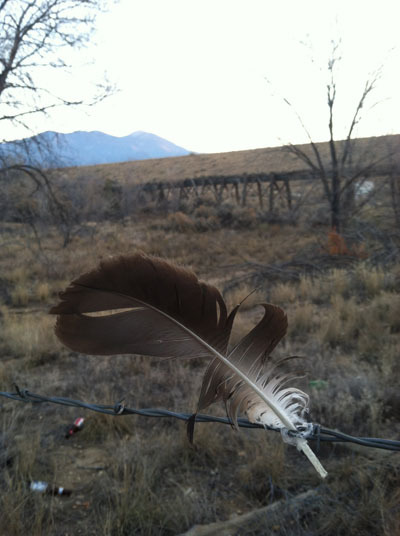 All along the way, in typical Taos fashion, I was reminded that this is a soul place for me. It feels a lot like home…. Catch this post on Dwellable!!!! Amy – love your blog. It fills me with joy to see a life so well-lived. 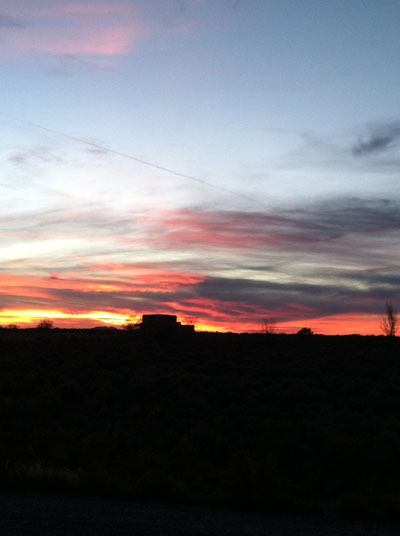 Wish I could go to Taos with you! Angie, me too! Oh wouldn’t we have a time of it!!! 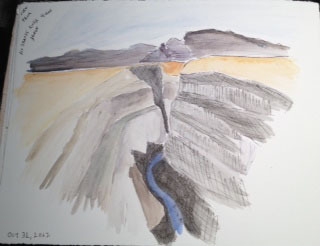 I think that someday I shall travel to the Land DownUnder and we shall sketch the magic of your Blue Mountains…..